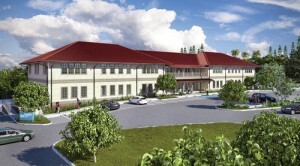 The Hawaii Medical Service Association on Tuesday announced plans to build a new office building in Keaau. Since opening its first Hawaii Island office in Hilo the same day as the deadly April Fool’s Day tsunami of 1946, HMSA has added two more offices — call centers that are not open to the public — on the Big Island, employing 45 people in total. The new building will be able to accommodate up to 100 employees, according to HMSA spokeswoman Robyn Kuraoka. “This is an investment in the health care infrastructure on Hawaii Island,” HMSA Chief Financial and Services Officer Steve Van Ribbink said via a press release. The 20,000-square-foot complex will encompass new customer service, sales and call center operations. It is expected to be ready by the end of 2014. It will be located at the corner of Old Volcano and Keaau-Pahoa roads on two acres recently purchased for just over $1 million from W.H. Shipman Ltd.
Construction is slated to begin in August, although no contractor has been selected yet, Kuraoka said. All that sits on the site at the moment is an avocado tree. HMSA first began working with Shipman three years ago in its search for land for a new building, said Shipman President Bill Walter. “What we’re seeing are good quality jobs coming to Puna, which is important for Keaau and Puna,” he said. Shipman has retained the front portion of the property to provide retail services in a single-story building or buildings that will total between 7,000 and 8,000 square feet, Walter said. Parking for both the HMSA office and future retail space will be accessible from both Old Volcano Road and the entrance to the Shipman gym. As for HMSA, it was seeking a location that would be “readily accessible and have the convenience of a small town,” Walter said. The building’s design will be in the plantation style, with gabled roofs, ample overhang and breezeways. HMSA is a nonprofit founded in Hawaii in 1938. It is an independent licensee of the Blue Cross and Blue Shield Association. W.H. Shipman is a family-owned company with more than 16,000 acres of land and a 130-year history in Puna.